On Saturday, 7 May 2011, Janice and I met Josh C. & Sara F. and Josh’s brother Jeff at the Showcase Cinemas at Legacy Place in Dedham, Massachusetts. We screened Thor and found the latest comic-book movie adaptation to be entertaining. If you’re looking for a faithful approach to Norse mythology, this isn’t the place. On the other hand, Marvel/Disney and Paramount are fairly respectful of the characters and imagery of Jack Kirby, Walt Simonson, and artist Oliver Copiel and Babylon 5 creator J. Michael Stracyznski. Director Kenneth Branagh, who is better known for his excellent Shakespearean films Henry V, Much Ado About Nothing, and Hamlet, deftly gets strong performances from his cast and focuses on the human drama amid the mythic action. Aussie actor Chris Hemsworth (who played James T. Kirk’s father in the Star Trek reboot) is bulked-up and charismatic as the god of thunder, who’s easily the equal in power or personality of anyone else in Marvel’s superhero pantheon. Tom Hiddleston, Branagh’s co-star in the moody Wallander, is appropriately scheming as Thor’s foster brother Loki, and Anthony Hopkins lends gravitas as Odin. Other Asgardians include Renee Russo as Thor’s mother Frigga, Ray Stevenson as the portly Volstagg of the Warriors Three, and Jamie Alexander as female warrior Sif. All stand with Thor as he learns humility after being exiled to Midgard (Earth). Despite some early complaints about the colorblind casting of Idris Elba as Heimdall, guardian of the Bifrost, and Tadanobu Asano as Hogun, it didn’t bother me as “racebending” in other movies has. Genre veteran Natalie Portman is fine as astrophysicist Dr. Jane Foster (originally a nurse in the comics), and Kat Dennings lends some comic relief as her snarky colleague Darcy Lewis. Since the trailers showed SHIELD’s Agent Coulson, played by Clark Gregg, it should come as no surprise that Thor continues laying the path started by Iron Man toward an Avengers cinematic teamup. Thor‘s script, which had several screenwriters, is serviceable and has a good amount of humor. The soundtrack could have been more operatic, but the fight scenes are well choreographed, especially in an early battle with frost giants in Jotunheim. The nine realms of Norse lore are described as worlds joined by an extradimensional tree, with Asgardian science being sufficiently advanced so as to be indistinguishable by humans from magic, directly quoting Arthur C. Clarke. In fact, the massive sets and potentially goofy costumes were closer to their comic book roots than most recent superhero movies have been. I prefer such faithfulness and hope that DC/Warner Brothers’ similarly cosmic Green Lantern also handles cosmic drama well. Thor‘s 3-D effect, which was added in postproduction, didn’t add much to the visual experience and even made tracking movement more difficult. Despite only decent initial box-office returns in the U.S. (compared with Iron Man or The Dark Knight), I hope that Thor continues the trend of successful superhero flicks. 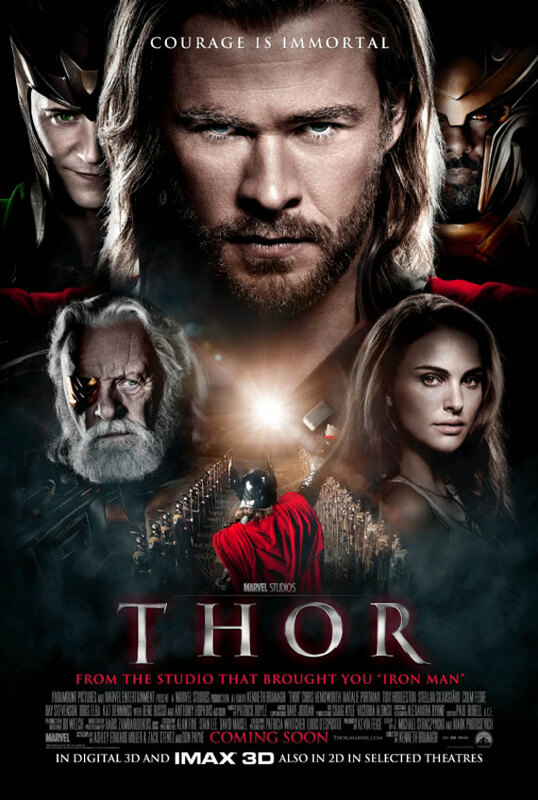 Overall, I’d give Thor, which is rated PG for violence, an 8 out of 10, a solid “B,” or three out of five stars. After the movie, we had lunch at Whole Foods’ extensive salad bar. Janice and I then went to Free Comic Book Day at New England Comics and Newbury Comics in Norwood, Mass. Because we went to the shops after the movie, many of the free issues had already been snapped up. Still, I want a new generation of readers to discover the medium and hobby. Posted on May 10, 2011 by GeneD5Posted in Comic books & superheroes, Movies, Reading & WritingTagged comic book, review.